I was excited about learning how to make Italian Christmas cookie recipes. Many people of all generations share these recipes as they come together to do holiday baking. Baking cookies together is a perfect holiday activity. Holidays are a time when all the special recipes are brought out for celebration. Ingredients which we may not use the rest of the year are used for these special recipes. For me, these small pastries and the time spent making them symbolize the spirit of the holidays. When I lived in Ohio and had so much family around me, plus my own family all at home, I would make thousands of Christmas cookies. 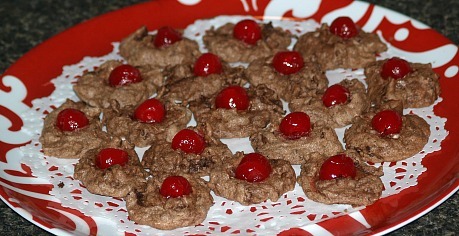 I learned how to make Italian Christmas cookie recipes along with my other cookies. All of the recipes which I made were only for this one time of the year. Each year, I started my baking the weekend of Thanksgiving and I did not stop until Christmas. Yes, a lot of work but I loved every minute of it. I always had a plate waiting for visiting guests when they arrived to sample the day’s production. A few days before Christmas I would box them up and put pretty bows on the boxes. I would save one large tray to freeze for New Year’s Eve. After boxing, I would set out to deliver the boxes of cookies to family and friends. They all enjoyed these homemade cookies better than any gift. As I learned how to make Italian Christmas cookie recipes or special recipes from other countries, I found their history also to be interesting. Most can be traced back to old Europe with ingredients like cinnamon, cloves, ginger, dried fruit and nuts. Here in the United States we have had the opportunity of collecting recipes from all over the world because of the “melting pot” which we are. Although I mostly cook from my German heritage, I have picked up recipes from Britain, France, Italy, Hungary and some Spanish countries. With the exception of a few recipes because they are so much alike, I forget which country I got them from; I mostly remember the people who gave them to me. Like other recipes, many are similar but are called by a different name. The art of making Italian Christmas cookie recipes is using fresh simple ingredients and turning them into wonderful tasty pastries. 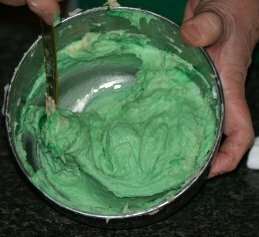 Cooks have learned to lighten and enrich paste mixtures with eggs, butter and cream; then they would sweeten with fruit, honey and sugar when it became available. Learning to use spices like cinnamon, cardamom, anise, allspice and cloves in the right proportions produces some very aromatic and flavorful products. I love the Italian Christmas cookies with fillings like the fig cookies; this is very common in many of the European countries. At holiday time these fillings are indispensable. Whether you are using jams, dried fruit or cream recipes, these are some of my favorites and I only bake these at Christmas time. 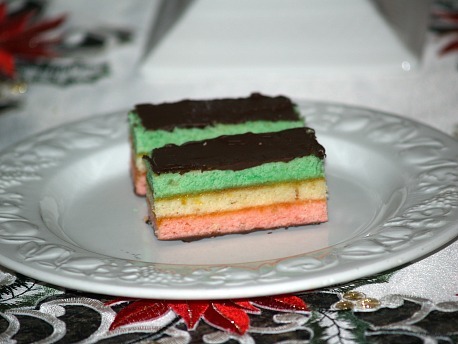 This is one of the traditional Italian Christmas cookie recipes. Grease three 9x13x2 inch baking pans, line with wax paper and grease paper. Break up paste in a bowl with fork. Add butter, sugar, yolks and extract. Cream with mixer. Beat in the flour and salt. Beat egg whites until stiff peaks form; fold into the almond mixture. Part 1 Remove 1 ½ Cups of the batter and spread evenly into one of the prepared pans. Part 2 Remove another 1 ½ cups and place in a small bowl; add the green food coloring to this bowl. Blend in coloring and spread into the second prepared pan. 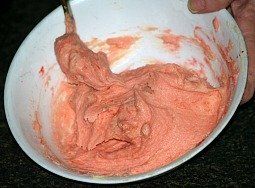 Part 3 Add the red food coloring to the remaining batter. 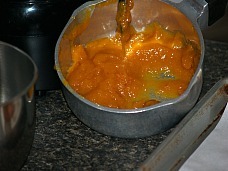 Blend in the color and spread batter into the third pan. Bake each pan in the oven for about 15 minutes or until the edges become slightly brown. When baked, turn immediately out on wire rack to cool and remove wax paper. 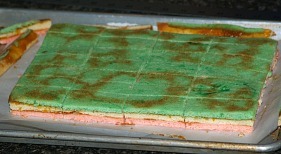 When cold, place pink layer on a tray. Heat preserves and strain. Spread half of strained preserves on top of the pink cake. Top with the yellow layer and spread remaining strained preserves over top. 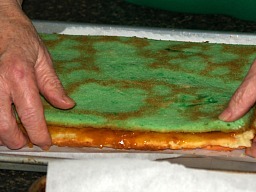 Cover with green layer. Cover with plastic wrap. Weigh cake down with heavy cutting board (or something similar) and refrigerate overnight. Melt chocolate in a double boiler. Trim cake edges even. 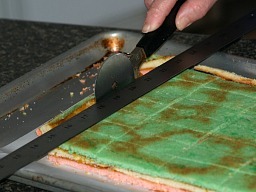 Cut cake crosswise into 1 inch strips. 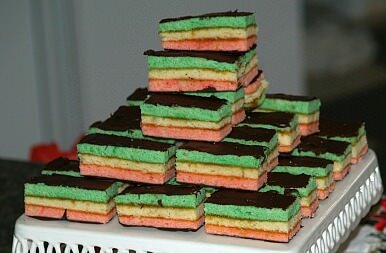 Frost pink and green sides of strips with the chocolate. Set on side until chocolate gets firm. Cut strips into smaller pieces. Although biscotti are a cookie for year round, it is a must to include in your Italian Christmas cookie recipes. Preheat oven to 375F degrees; grease two 9 X 5 inch loaf pans. Cream together butter and sugar in a large bowl; add eggs and mix until smooth. Sift flour and baking powder together; stir into the egg and sugar mixture. Stir in anise oil and vanilla; knead until dough is smooth. Divide dough in half; shape each into loaf 3 inches wide and ¾ inch thick. Place loaves in greased pans and bake 15 minutes or until pick comes out clean. Remove pans from oven and let loaves cool slightly; remove loaves from the pans. Cut loaves into 1 inch crosswise slices; place slices on greased baking sheet. Toast slices about 1 to 2 minutes under broiler watching closely and turning to toast other side. This chocolate macaroons recipe is known as a party cookie. 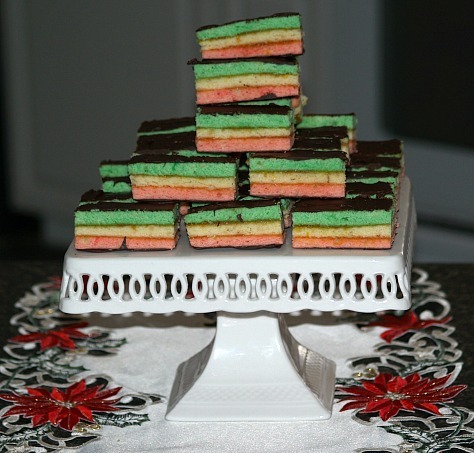 I am not sure if it is one of the Italian Christmas cookie recipes but it is good so it could be one. Beat egg whites until frothy; add sugar and salt and beat until stiff but not dry. In medium bowl combine chocolate, vanilla, cinnamon and coconut; gently fold in beaten egg whites. Drop batter by teaspoons onto lightly greased baking sheet; bake 15 minutes. Cool on rack and store in airtight container. Cannoli recipes are good anytime of the year; they make great Italian Christmas cookie recipes. In medium bowl stir dry ricotta (drain in cheesecloth if wet), sugar, citron, orange peel and cinnamon until smooth. Just before serving spoon ricotta mixture into prepared cannoli shells. Sprinkle ends with pistachios and dust with powdered sugar. 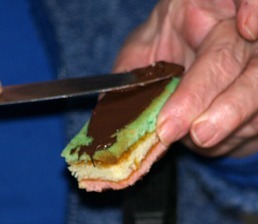 This is one of the Italian Christmas cookie recipes out of Naples; it is filled with jam. Combine flour and sugar; mix in oil and enough water to make soft dough. Roll pastry out thin on floured surface; cut out 2 to 3 inch rounds. Place dab of jam in center of round; fold in half and press edges together to seal. Lay on a baking sheet and brush with egg yolk. Bake for about 20 minutes or until golden brown; cool and serve. Some of the Italian Christmas cookie recipes are a little different like this one which is deep fried. These traditional honey coated Christmas sweets are piled in a pyramid and used as a centerpiece which is broken off and eaten at the end of the meal. Combine flour, 1 tablespoon orange peel, lemon peel and salt in large bowl; cut in the butter. Add eggs and vanilla and stir in with a fork; mix until all four is mixed in. Knead on a floured surface about 5 minutes; add a little more flour if needed to prevent stickiness. Cover dough and let stand for 1 hour at room temperature. Break off walnut size pieces of dough; roll on flour surface to pencil thin strips 14 to 15 inches long. Cut each strip into ¼ inch pieces to make struffoli. When golden brown remove with slotted spoon and drain on paper towels. Heat honey and sugar in heavy large saucepan over medium heat until mixture is clear. Add remaining orange peel, the struffoli and candied fruit. Transfer honey coated struffoli and candied fruit to the buttered plate and let cool slightly. 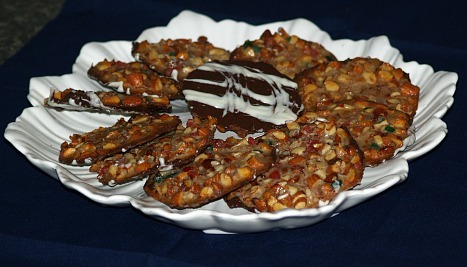 Moisten hands with cold water and shape struffoli into pyramid; decorate with additional candied fruit. 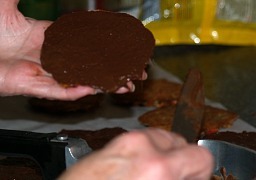 Break apart to serve; serve these Italian Christmas cookie recipe as soon as possible. A swirl of white chocolate adds a new twist to the traditional Italian Christmas cookie recipes. 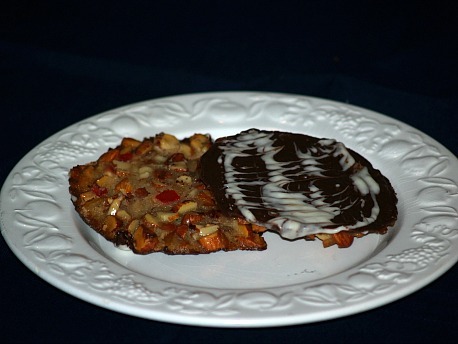 This fruit and nut biscuit is traditionally iced on the bottom with dark chocolate. Combine butter, milk, sugar and honey; bring to a full rolling boil stirring occasionally. 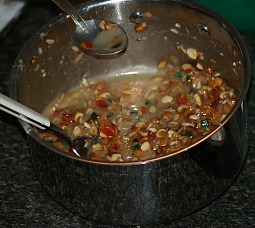 Remove from heat (mixture will appear curdled); stir in almonds and candied fruits. Stir in flour; drop by level tablespoons 3 inches apart on greased and lightly floured baking sheet. NOTE: Must grease and flour baking sheet; cookies spread too much without flour. With back of spoon spread dough to make 3 inch circles. 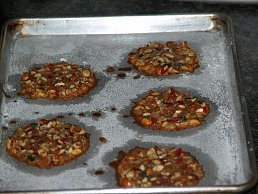 Bake for 8 to 10 minutes or until edges are lightly brown. Cool on tray for 1 minute then remove from tray to cool thoroughly. NOTE: Must remove cookies from baking sheet after ONLY 1 minute; they stick if you let cool too long. In small saucepan over low heat melt semi sweet chocolate with 2 tablespoons shortening; spread bottom of each cookie with 1 teaspoon of melted chocolate. In another small saucepan melt over low the white chocolate and 2 teaspoons shortening; drizzle white chocolate over dark chocolate of each cookie with fork to make marble effect. After chocolate sets store in refrigerator.